In Punta Mita, the most exclusive development in Mexico, there are two Five Diamond hotels that together offer over 1,000 m² (10,764 ft²): the Four Seasons Resort Punta Mita with 643 m² (6,921 ft²) divided between the Toki and Takua rooms; and The St. Regis Punta Mita Resort with 478 m² (5,145 ft²) of available space, with their largest room being the Astor. The Three-Diamond Villa del Palmar Flamingos and the Four-Diamond Villa La Estancia, both from the Villa Group chain, have 510 m² (5,490 ft²) available in their Grand Ballroom. This Four-Diamond development located in Nuevo Vallarta has the Dreams Ballroom available for conferences and meetings, with 618 m² (6,652 ft²) of space. 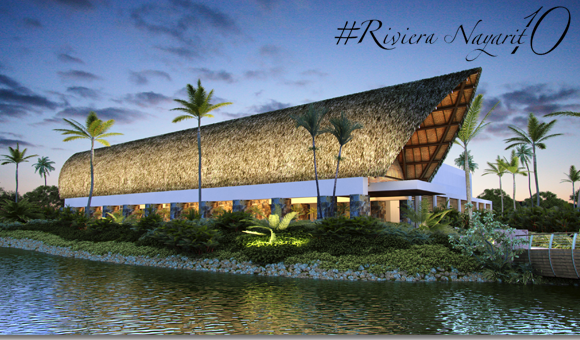 Located in the Litibú development, this Spanish five-star resort opened in Mexico’s Pacific Treasure in 2013. It offers 655 m² (7,050 ft²) for meetings in its Riviera Nayarit Ballroom, which hosted the TMS Family Travel Summit in 2015. This is undoubtedly one of the most sought-after properties in the destination thanks to its excellent Five-Diamond service. Its Grand Marissa, Tamayo I and Tamayo II meeting rooms together offer 875 m² (9,418 ft²) of flexible space. Even though it boasts five stars, this resort is accessible and flexible to host all kinds of events, for example, the Salsa Mambo Fest on several occasions. Its meeting rooms offer 705 m² (7,589 ft²) of space, plus a 265-m² (2,852 ft²) foyer and a 173-m² (1,862 ft²) patio, for a total of 1,143 m² (12,303 ft²). This five-star hotel is one of Nuevo Vallarta’s classics. It has over 1,430 m² (15,392 ft²) of available space for events, among them the Grand Salon and the Salon del Sol. It has hosted a large number of world-class conferences and meetings. The Belair is a four-star establishment that is currently undergoing a renovation, which includes new convention areas that together add up to 3,150 m² (33,906 ft²) of space: the Bucerías Grand Salon will be the largest interior space with 1,400 m² (15,069 ft²) available to welcome up to 1,600 people and can be divided into six separate rooms. There is also a 750-m² (8,073 ft²) foyer available for events. The Sanctuary Convention Center was inaugurated in 2015. This multifunction space has nearly 1,200 m² (12,900 ft²) of space and tripled the hotel’s meeting and event space to nearly 1,860 m² (20,000 ft²). In first place is the magnificent development by Grupo Vidanta, a complex that includes five hotels. The Vidanta Convention Center is slated for a March-April 2017, a space with four main spaces that add up to over 3,000 m² (32,292 ft²) with room for up to 2,400 people. This is in addition to the Sanctuary and the other meeting space already available.